The crowd roared in appreciation of a player who, in truth, has taken time to settle in his opening five months in the Premier League. It lifted the whole atmosphere and the supporters helped the Reds get over the line. "It think it was a good challenge," he said. "It was a 50/50 ball and I just thought I have to win this ball and I did. We are delighted with the clean sheet, we are always trying to do a good defensive job, and trying not to concede goals. We did do that today and that was very good for us." 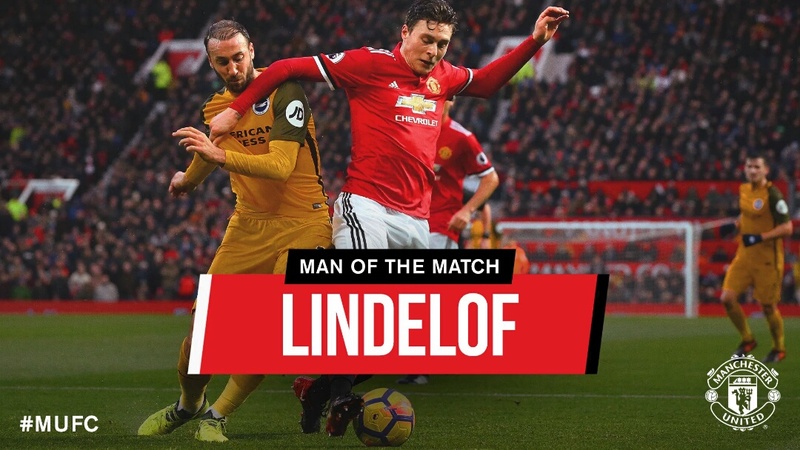 Lindelof came in for criticism in some quarters in a couple of his opening outings for the Reds but his Man-of-the Match performance against Brighton and, in particular, the memorable tackle on Knockaert earned rave reviews from two former United stars who believe it could be the turning point he needs. Former defender David May told MUTV after the win: "The tackle kickstarted him. I thought he was one of our best players and I think it's the best game he has played for us." Lindelof’s talent has never been in question. He starred in Sweden’s recent World Cup qualification, keeping Italy’s attacking riches at bay, twice, but Jose Mourinho has admitted in recent months that the 23-year-old will need time to adapt to the physical challenges and pace of the Premier League. But patience is a rare commodity in modern football. Many will forget a certain Nemanja Vidic, who was signed from Spartak Moscow in 2006 and made his debut, along with Patrice Evra, in the Manchester derby. Both had a day to forget - Evra was hauled off at half-time - as United were beaten 4-1. Vidic and Evra were given the time to adapt and as we all know, went on to become United legends. History suggests Lindelof deserves the same time to prove his worth and the fans were in agreement this weekend. Some 57 per cent of votes went for the centre-back, with Ashley Young second on 37 per cent and Nemanja Matic in third on six per cent.